The four wings palace is a part of Prague landmark reservation registered on UNESCO list. It stands at the begining of Kanovnická street, the main front faces the Hradčanské square. 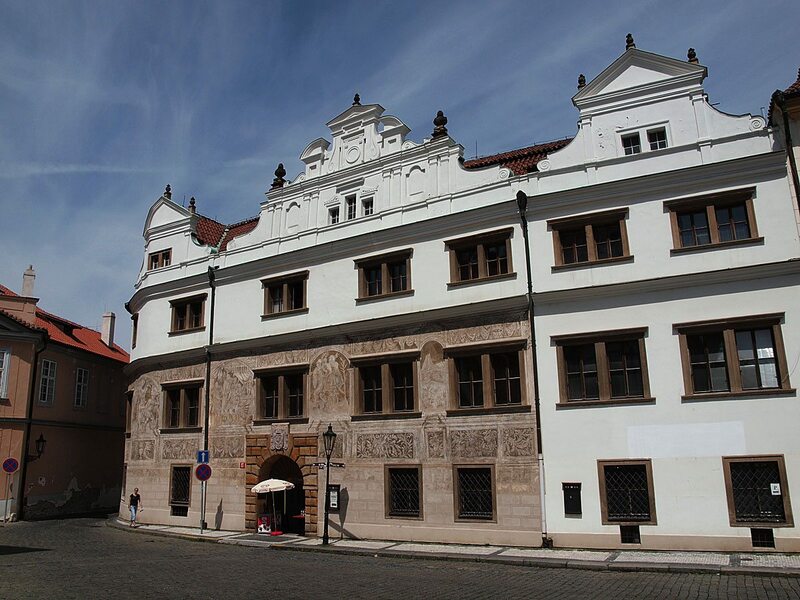 The Palace belongs to the most beautiful renaissance houses in Prague that date back to the half of the XVIth Century.At first 4 gothic houses were situated here in the second half of the 14th century. One of them belonged to the well known chronicler Beneš Krabice from Weitmile who was the first master builder of the St. V.C. These four houses were damaged by the big fire in 1541 which started on the Lesser town and destroyed most of Hradčany. About 10 years after Mr. Ondřej Teuffel of Zeulberg bought the remaining ruins and started to build his representative house here. As a leader of Hungarian fortress „Raab“ he never had enough time to spend in Prague, so in 1580 he sold the house to Mr. Jiří Bořita of Martinice. Mr. Jiří extended the east wing and started the first Renaissance reconstruction. The sgraffitis date to this phase of construction. After his death the palace moved to the hands of his nephew, Jaroslav Bořita of Martinice, who was 16 years old, so he didn´t do anything with the palace. 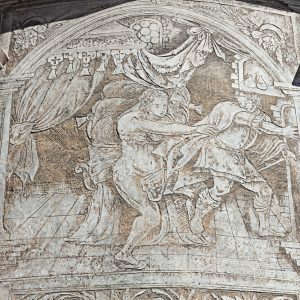 Before he could have started his activities here, the second defenestration occured on 23rd May 1618. Jaroslav together with Vilém Slavata of Chlum and their scripturer Filip Fabricius, were thrown out of the windows of the Czech office at the Prague castle for political and religious reasons. Jaroslav left the Czech kingdom afterwards and his assets were confiscated. He came back after the year 1622 and started reconstructing the palace, now in early baroque style (it´s possible to say that). Two wings were built – the northern and the middle one, the western wing to Kanovnická street was finished. Our palace also recieved the new stone portal with beautiful stone coat of arms of Martinic families – two white water lilies growing up from one root with a golden star in the middle in a red field.After his death the palace moved to the hands of his nephew, Jaroslav Bořita of Martinice, who was 16 years old, so he didn´t do anything with the palace. 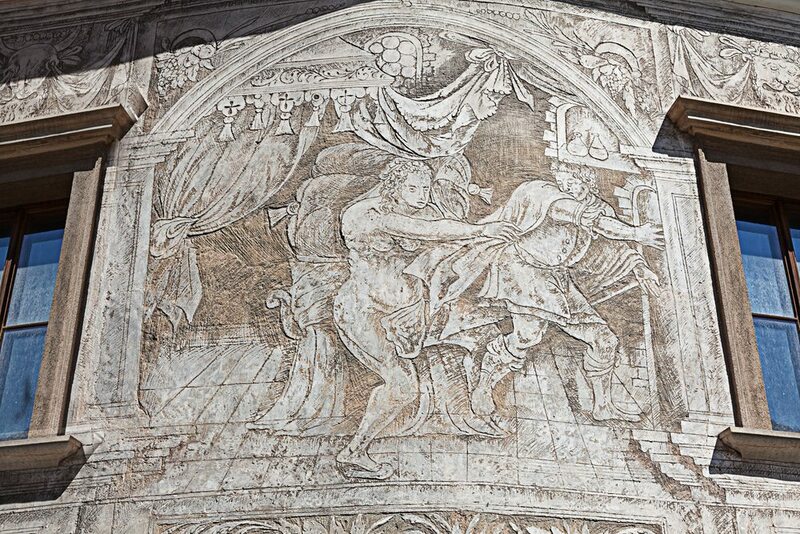 Before he could have started his activities here, the second defenestration occured on 23rd May 1618. Jaroslav together with Vilém Slavata of Chlum and their scripturer Filip Fabricius, were thrown out of the windows of the Czech office at the Prague castle for political and religious reasons. Jaroslav left the Czech kingdom afterwards and his assets were confiscated. He came back after the year 1622 and started reconstructing the palace, now in early baroque style (it´s possible to say that). Two wings were built – the northern and the middle one, the western wing to Kanovnická street was finished. Our palace also recieved the new stone portal with beautiful stone coat of arms of Martinic families – two white water lilies growing up from one root with a golden star in the middle in a red field. Jaroslav´s oldest son Jiří was not interested in this palace, thus, in 1629 he bought a land in Loretánská street and he started building his own large and fully baroque palace there. 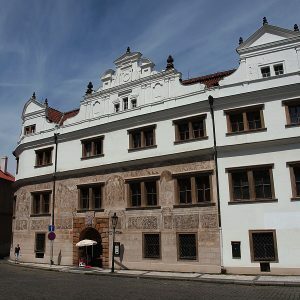 After Jaroslav´s death in 1649, Jiří moved his clerks and servants into the new palace. The old house lost its importance. The heritors quarrelled among themselves and they didn´t have money for fixing the palace. At the end of 18th century the Martinic family died out. The last female member of the family, Mrs. Marie-Anna Clam-Martinic, sold the palace to Mrs. Josefa Weitenweber, who started renting the rooms. The groundfloor of the palace was rented too – bakery, locksmither´s was placed where now the cashdesk stands, police station, cows in the stable, apple orchard and carpenters were in the garden. 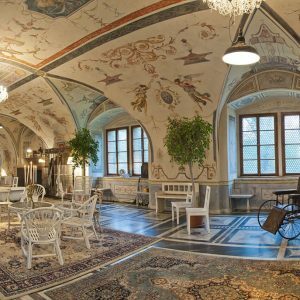 In 1835 the northern wing was hit by a lightning and after this happened Mrs.Josefa sold the house to Mrs. Barbara Trödl, who rapidly increased the numer of families living in the palace. In 1840 the new „rebuilding“ took place, during which the big hall was refloored etc., so the palace was changed into a big slum, where living was almost impossible. At the end of 19th century about 70 families lived here!!! After political changes in 1948 Martinic palace was nationalized, which, in this case, was really helpful. In 50ties the first restoration works started and the great reconstruction lasted from 1966 till 1972. After the restoration had been terminated The Center of the Chief Architect of the City of Prague (Útvar hlavního architekta města Prahy) moved in. Since 2002 our palace has had a private owner again.